One of my favourite shows of the last 10 years, returns for a long awaited fourth season. 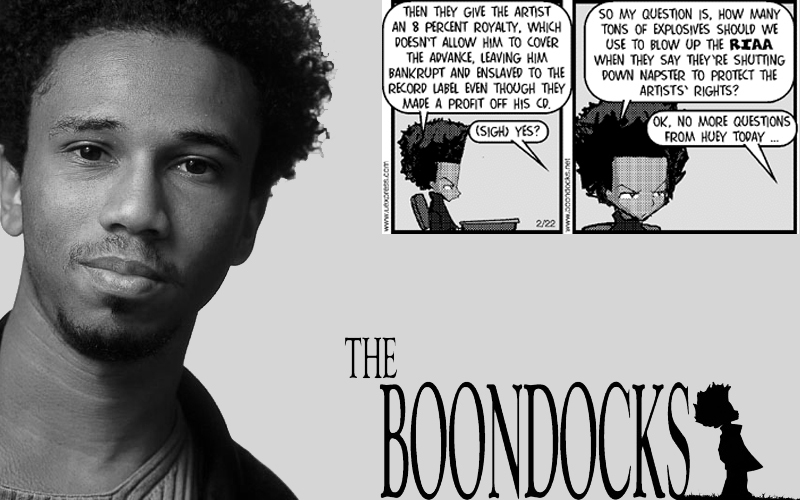 The Boondocks premiered in 2005 to much controversy and acclaim. The edgy, award winning animated series, based on the comic strip of the same name, spotlighted the highs and mostly lows of African American culture in a satirical way. Loved and hated by many, the show gained both popularity and notoriety since its debut. One of the things that fans have complained about since the show began was its inconsistency. The brilliant mind that brought the show to the world, Aaron McGruder, seemed to lack the focus and drive to bring the show on a regular, season by season basis, with 2 years passing between the first and second season, 3 between the second and third and now 4 years passing before the announcement of the first season… Hmmm.. Maybe, he has devoloped a pattern. On one hand, I’m concerned whether the integrity of the show will be maintained. On the other hand, with it now out of his hands, we can look forward regular seasons. Only time can tell whether this will be a good or bad thing. Until, then… BOONDOCKS BABY!